Mrs Nan Black supplied a very interesting photo of Fleming Reid’s Mill around the time of the Coronation in 1953. She and her aunt Mary are both in the photo and you can see the bunting up to celebrate the occasion. Nan was fifteen when she started work at the Merino Mill. She is not even sure what she earned as she had to hand her unopened pay packet over to her mother. Sometimes there was overtime on offer for those who wanted to earn a bit of extra money but Nan did not bother to do overtime. She got no extra money from her mother so she did not see why she should give up her free time and work additional hours. Nan’s Mum found out about her turning down overtime and she got her ears boxed for her trouble! It was in the Despatch department that Nan worked and her boss was a Mr. Summers. Many of the “Girls” mentioned him and said he was a strict man but was also fair with them. He appeared to have been well respected and the girls did not try any nonsense with him. Nan’s Auntie Mary worked in the Merino Mill also. Both of them were involved in using teasels to brush bed jackets and capes to make them “fuzzy-wuzzy”. 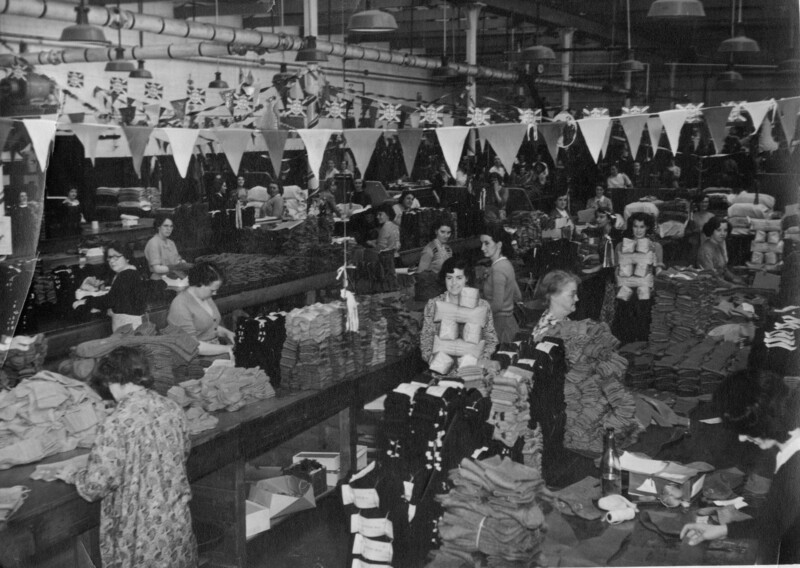 Nan was involved in the packing and despatch of stockings too. As far as safety was concerned, Nan remembers a workmate called Jean Whiteford who had her fingers injured when using a guillotine. She was off work for a long time and was sent to the Co-operative Homes in Largs to convalesce. There was no mention of compensation, however. Sometimes the girls used to go dancing straight after work and they would bring in their finery to change in the toilets at the end of their shift. They often went to the dancing at Lithgow’s up at Boundary Street between Greenock and the Port. One evening Nan went to the toilet at Lithgow’s and discovered that, in her haste to get changed, she was still wearing her working skirt under her good skirt. 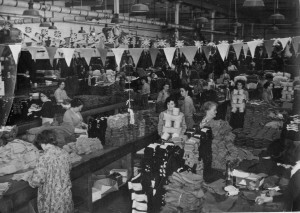 Even though the mill was decorated for the Coronation, there was no day’s holiday for the workers. It was business as usual. Nan’s sister Jean also worked at the Merino Mill. She was a twister. Nan used to joke that she was a twister by nature too. Jean is now eighty one. Nan is yet another worker at the mill who mentioned the noise levels and how they had to learn to lip read. Fortunately, Nan’s hearing was not unduly affected by the noise. As soon as she could Nan left Fleming Reid’s to work at the Royal Ordnance Factory in Bishopton where the wages were much higher. In later life, Nan had many interesting jobs like a bar-maid and a taxi driver.